For every action there is an equal and opposite reaction, or at least so goes one of Newton’s theories. One could also say in this day and age for every new kit released by one company another one will release its own version in competion, and here Bronco is now releasing its take on modern PLA tanks to compete with Hobby Boss. Having recently reviewed the Hobby Boss version of this tank, let me summarize a bit of its history. Current Chinese main battle tank design began with the WZ-123 or ZTZ-96, which was the transitional mechanical model between the T-54A and T-72M designs. 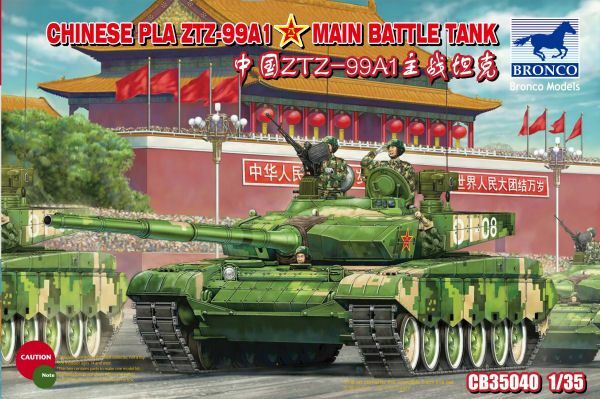 An improved version, the ZTZ-98, was first publically shown in 1999 at the PRC 50th Anniversary Parade. This tank was longer and lower than the T-72M it was based on, and used several innovative features such as a laser blinder for use against ATGM teams. This tank evolved into the ZTZ-99. which appears to be the family which the Chinese will make their new standard tank system. There are at least three models of the tank in service (albeit in small numbers): the ZTZ-99A, which is based on the T-72M with a copy of the German MTU MB 870 V engine (1500 HP), a ZTB-98 125mm gun (equivalent to the 2A46M) with the ability to fire a Chinese made version of the 9M119 “Refleks” antitank guided missile, and other modifications. There is currently some argument as to what the current tanks are actually called. Hobby Boss referred to their kit as a “ZTZ-99B” (No. 82440) whereas Bronco calls the exact same vehicle a ZTZ-99A1. From what I have received in the way of comments, this is apparently the more accurate designator of the two. Whichever is correct, this is the vehicle which was paraded in August 2009 at the PRC’s 60th Anniversary Parade. The main difference in this case is the fact that the ZTZ-99 series are the first tanks in the world fielded with first replaceable modular armor on the front of the turret and now built-in reactive armor in those modules. This essentially means any ZTZ-99 can be upgraded to the latest level of turret protection in a matter of a few hours (there is some suspicion they bought the design from KBTM in Omsk). It has the 125mm gun (now reportedly equivalent to the Russian 2A46M5 variant), a 7.62mm coaxial machine gun, a 12.7mm AA MG and the laser blinding system. 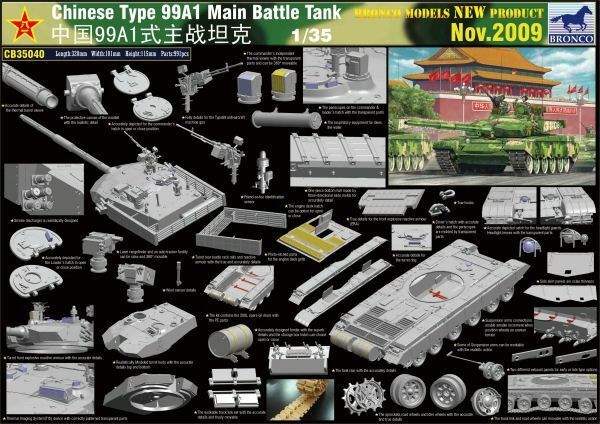 While Hobby Boss is releasing kits it calls the ZTZ-96, ZTZ-96A, ZTZ-99 and ZTZ-99B. Bronco is doing those of the ZTZ-98, ZTZ-99A, ZTZ-99A1, and ZTZ-99G. Sorting them all out will take time. Bronco has a bit of a different take on this tank, and its kit is much more detailed (read a lot more parts) than the Hobby Boss kit. There are more options in the way of detail items (such as two different sets of exhaust outlets built into the fender panniers) and a set of clear parts for the vehicle. Frankly, I don’t find most clear parts very useful as the marker and tail lights must be painted and the viewer blocks need tinting, but it appears to be popular with the model companies. In a similar fashion to the Hobby Boss kit, this kit also has its quirks. The“blade” type shock absorbers (similar to the Russian ones, parts B23) do not connect to the road wheel arms, but have a connected piston buffer (parts B20-21) which is not found in the Hobby Boss kit. Go figure. This kit uses end caps cemented in place to permit movement of all of the wheels vice vinyl keepers; however, it does not note it in the directions but if the tracks are to move the drivers must be left loose. Also, the kit comes with three working torsion bars per side (stations 2, 3 and 4) so the suspension may be “posed”. This kit will have some serious comments about its design among modelers, for while it comes with working tracks each link consists of four parts - inner pad and tooth, frame, and two external pads. The result is that the tracks consist of well over 550 parts alone and will require a long time to assemble if the modeler wants them to actually work. These replicate the “asphalt” or “street” tracks as were used in the parade; Bronco is also going to produce the “combat” tracks with US T80 type steel chevron cleats. The entire glacis reactive armor array is a single piece (J19) and installs at one shot. Like the Hobby Boss kit, it appears to be designed to fit over the glacis fittings left over from the ZTZ-96 and ZTZ-98 designs with no modification required. The lights and other glacis details mount on it or through it once in place. Note that all six etched brass grilles have to be installed at this time as well. The fenders are separate which is good, but unlike the Hobby Boss kit the sponson bins and fuel tanks have separate details and bin covers so the modeler has some options. As noted before there are a choice of two different designs of exhaust outlets for the bins. The kit comes with all of the details needed for the turret for this vehicle to include two single-piece reactive armor arrays at the rear; each of them has an interior liner which is correct, but this kit has separate bars for the rear turret basket sides. The turret also has a more detailed laser warning device and laser blinder device. Ten individual barrels for smoke grenade launchers form four assemblies (two fours and two singles) for the sides of the turret, and the lift rings for the frontal armor modules are provided as separate parts as well. The QJC-88 machine gun (a lightweight Chinese redesign of the famous “Dushka”) comes on a separate sprue and consists of 16 parts in its own right (two more than the Hobby Boss one). The main gun comes in two halves with a muzzle cap but appears to be close to scale, but appears to have most of the bolts and other fittings not present on the Hobby Boss kit. The mantlet comes with two mantlets, each with a molded canvas cover; one is for the gun at zero elevation and one at a slight angle but the gun is apparently not supposed to be left moveable. All crew hatches may be positioned as desired, and the commander’s and gunner’s hatches come with interior details. Like the Hobby Boss kit there are etched brass parts provided (grilles and the straps for the auxiliary fuel tanks and a guard for the commander’s viewer). The tow cables have quite intricate attachment points at the rear and a rigging diagram (!) is provided to get it correct. The kit comes with a very nicely laid out instruction booklet, and while it uses the “stick here” type of directions they are much clearer and better separated. It also color matches the options for four main brands of paint (Gunze Sangyo, Hobby Color, Humbrol and Tamiya). Overall this model is an excellent rendition of the tank, and the modeler now has a choice between a “quick build” with the Hobby Boss kit or a more detailed model with the Bronco kit.